Rabbi Meir Azari of Beit Daniel - The Center for Progressive Judaism in Tel Aviv wrote in the Winter 1996 CCAR Journal of Abba Hillel Silver's visit in August 1948, shortly after the establishment of the state. Who remembers that, when Rabbi Silver came to Israel shortly after its establishment, he was welcomed by a crowd numbering tens of thousands? "This visit in Israel received a scope of a national holiday," writes Isaiah Vinograd in his book on Abba Hillel Silver. "It was an occasion of great value to the future of Israel's relations and communication with diaspora Jews. In the demonstration of welcome, which was the first of such magnitude in the history of the land ... the people expressed not only their personal gratitude to the man who headed our struggle in the United States and United Nations during the terrible crisis, but also the identification of the people with his political approach in the World Zionist Movement." 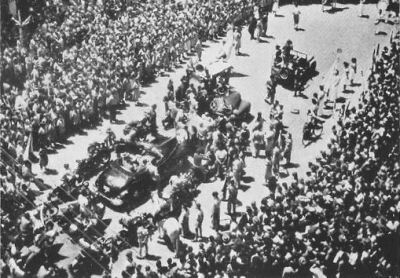 Abba Hillel Silver (in open car) greeted by crowds in Israel. In 1981 the State of Israel issued this 3.2 shekel postage stamp to honor Rabbi Abba Hillel Silver. Shown without its tab (State of Israel stamps are printed with the tabs below the bottom row of stamps having some text describing the stamp), it is cataloged as Scott® 778. To see the stamp on the website Famous Portraits on the Stamps of Israel, click here. The site is by Dr. Samuel Zwetchkenbaum of the U. of Michigan. Six cities in Israel have a street named in honor of Abba Hillel Silver. Best known is Abba Hillel Silver Street in the Ramat-Gan section of Tel Aviv, its financial and business district and a world center for diamond cutting and marketing. 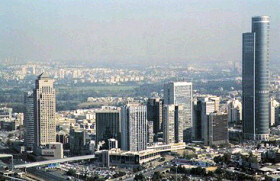 At the right of the picture is Israel's tallest office building, completed in 2001. Begun as an agricultural school, Kfar Silver now offers more academic programs. Seventy percent of its 1,000 students are new immigrants, mostly from the former Soviet Union, Ethiopia, and Latin America. Its facilities are used intensively each summer for a variety of camping experiences. more .. The ZOA still owns Kfar Silver but in March 2006 the Forward reported that it has not sent the school money for at least eight years. The World Zionist Organization presents several pages on Rabbi Abba Hillel Silver, who is perhaps best known as a leader in the Zionist movement. You will find a biography (with the photo we display on our Welcome page) and a description of his leadership in events in the 1940's such as the Biltmore Conference that helped to establish the State of Israel. The pages are in Homeward Bound, an interactive Zionist exposition, and in The Time Machine. The exhibit, well worth bookmarking and revisiting, is part of the pages of the Hagshama Department on the web site of the Jewish Agency for Israel - World Zionist Organization in Israel. The literal meaning of Hagshama is "fulfillment" -- the realization of Zionism which is Aliyah (literally "going up") to Israel. Eisenhower is directly behind Silver. Richard Nixon is at the right. Some think he said the invocation at the opening of the ceremony. Others believe he gave the benediction at the closing. Actually his was a third prayer, offered after the invocation and before the benediction. 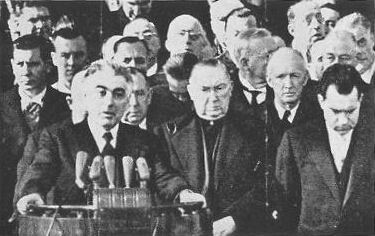 In this way the planners of Inauguration Day did not depart from the usual practice of a Protestant minister and a Roman Catholic priest saying the invocation and benediction. "He [Eisenhower] brushed away a tear when a special prayer was offered for him by Rabbi Abba Hillel Silver of Cleveland. The Rabbi had defended General Eisenhower last fall against charges by Mr. Truman that the General in his campaign had accepted the aid of those who practiced Nazi tenets of racial discrimination." 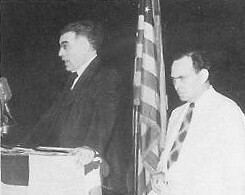 Though he voted for Democrats, Abba Hillel Silver was friendly to the Republican party at a time when almost all Jewish voters voted Democratic. He did not want the "Jewish vote" to be taken for granted by the Democrats. Silver made a point to note that he never openly supported a political candidate. He offered the invocation at the 1944 Republican convention. (Raphael, 110). The page is a story by Post reporter Edward T Folliard in the January 21, 1953 issue of the Washington Post. Ed Murrow's 30 minute television shows on CBS ran from 1952 through 1961. The usual format would split each show between a serious figure from government, industry or the world of ideas, and the second segment from what we would call today "popular culture" such as entertainment or sports. On November 12, 1954 the show began with Murrow visiting with Rabbi Silver and his wife Virginia in their Shaker Heights home. Then he interviewed actors Tony Curtis (Bernie Schwartz) and Janet Leigh. The April 6, 1953 issue of LIFE Magazine included a photo essay "12 Great American Preachers" by Mark Kauffman. Abba Hillel Silver was the only rabbi featured. The eleven other "preachers" included Protestants Reverend (Billy) Graham (then only 34) and Dr. Norman Vincent Peale and Roman Catholic Bishop Fulton J. Sheen. The caption is shown below. Dr. Silver, who stands here beside a replica of Michelangelo's Moses in the Temple in Cleveland, has the imposing look of an ancient Jewish leader. Tall and dark, he has a massive head and a shock of black, graying hair. When he preaches his words come out in organ tones. Born in Lithuania, Dr. Silver represents the fifth generation of rabbis in his family. Recalling that Moses, because he was "slow of speech" had to have his brother Aaron talk for him, Dr. Silver feels that the modern rabbi still needs to speak for Moses. "I have always looked on religion as a quest for social justice and a quest for God. The one found greatest expression among the prophets, the other among the mystics. In preaching I try to synthesize the two." An ardent Zionist, Dr. Silver organized support to get resolutions favoring the new state of Israel through both the U.S. Congress and the U.N. Assembly. More recently he made a deep impression by the moving prayer he offered at the Eisenhower inauguration. For books about him on this site, click here. Chapter One of Donald Neff's Fallen Pillars: U.S. Policy towards Palestine and Israel since 1945, tells how Abba Hillel Silver organized and led American Zionists in ways that helped change modern Jewish history. Entire chapters are in the Washington Post's Books and Reading section. The Abba Hillel Silver Chair of Jewish Studies at Case Western Reserve University in Cleveland was established in 1964 with gifts from the Edith Anisfield Wolf Fund of the Cleveland Foundation, the Louis D. Beaumont Foundation, and the Jewish Community Federation of Cleveland. Since January 2000 the Silver chair has been held by Peter Haas, an ordained Reform rabbi (H.U.C. 1974) who earned a Ph.D. in Jewish Studies from Brown University in 1980. Past holders of this chair were the late Bernard Martin (1966-1982) and Susannah Heschel (1991-1998), now Eli Black Professor of Jewish Studies at Dartmouth. This is not a story of recognition, but rather a story of Abba Hillel Silver in his later years when he no longer occupied leadership roles in American or world Zionism. See You're So Vain, You Probably Think This Sermon's About You by Rabbi Benjamin Scolnic. To read the entire sermon, click here. A friend of mine told me a story that I have never gotten out of my mind. It's about Rabbi Abba Hillel Silver, one of the great figures of modern Judaism. He was a great Zionist. He was one of the reasons that the State of Israel was re-created in our time. My friend was a young rabbi in Philadelphia and he was asked to pick Silver up at the train station. He was very honored to do so, and found Silver, towards the end of his life, to be charming and bright and attentive. But Silver's heyday was over, and only a group of twenty or so came to hear the man who had once roused the crowds. After the speech, my friend took Silver back to the train station. They had some time before the train came. The train station was empty. It was a cold, bleak winter night. And so my friend asked, "Rabbi Silver, I only mean you respect with this question. Why are you here? It's almost insulting for you, at this point, to spend your day speaking as you just did to such a small group. You should be at home, relaxing, you shouldn't be here in this station on this winter night. And Silver looked at him and said, "I thank you for your caring. But remember Moses. When God told him that he could not go to the Promised Land, Moses asked if he could go as a foot soldier. He knew that he could no longer be the leader of the Israelites, that he was older and burned-out and that the Israelites needed a new leader to conquer the Promised Land. But he wanted to go, and he was content to go any way he could, even as a common foot-soldier. And so that, my young friend, is why I'm here; I'm a foot soldier now. And I'm happy to play this role." Abba Hillel Silver had played a leading role; now he was willing to play a supporting role. I would have expected the great Rabbi Abba Hillel Silver to see that little trip to Philly as a comedown, as beneath him, as a blow to his pride. But he wasn't that vain. He mentioned Moses. Moses was the greatest figure in human history, and he was, according to the Torah, the humblest of men."